Did you know Intervals gives back 1% of all our revenue to environmental causes? That means 1% of your monthly payment goes directly to preserving the environment, to keeping the skies blue and the grasses green. Through our partnership with 1% for the Planet every dollar goes directly to the nonprofit organizations we support. This partnership, going on its sixth year now, would not be possible without our dedicated customers. So we say “thank you,” for your continued support of Intervals, and by extension, the environment. This year we embark on two new relationships with nonprofits located here in our hometown of Santa Barbara, California — The Land Trust for Santa Barbara County and Bici Centro. These two nonprofits are both working toward the goal of consuming less resources, but from two entirely different perspectives. The goal of the LTSBC is quite simple, they aim to preserve land throughout Santa Barbara County. 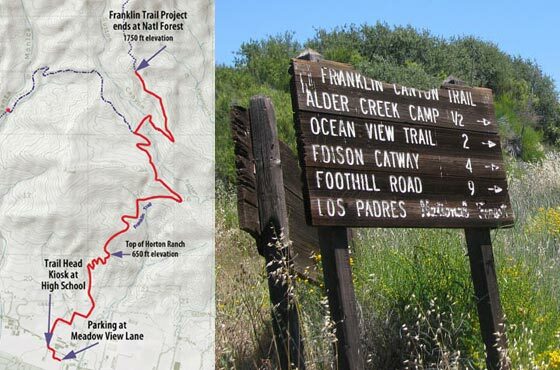 They’ve been making headlines recently after preserving one of the last undeveloped, private properties in the Santa Barbara foothills, and for working toward restoring access to the Santa Barbara backcountry from Carpinteria by way of the Franklin Trail. Our donation goes directly to the Franklin Trail project, which will open up new recreational opportunities in the south county. The Franklin Trail project is still a work in progress. The first phase is completed and includes 2.25 miles of trail. The second and final phase aims to open up the remaining five miles of trail, providing access through to the peak of the Santa Ynez Mountains and the backcountry beyond. Located on Santa Barbara’s East Side, just a few steps from our office, Bici Centro is a community DIY bicycle repair shop and education center. Their goal is to facilitate skill sharing and increase reliability and safety for Santa Barbara area bicyclists. If you’ve ever ridden your bike to a concert or festival in Santa Barbara, these are the folks offering free bike valet and on-the-spot bike repairs. Bici Centro has helped hundreds of people in our community — including me — build and repair bicycles. Their workshop is staffed with knowledgeable and encouraging volunteers ready to teach anyone the A-to-Z’s of bike maintenance. They also put on some great parties. If you find yourself in the Santa Barbara area in May, be sure to check out CycleMania, or the Open Streets event in the fall, or any of the Bike Moves events throughout the year. Or stop by the Bici Centro workshop and browse their selection of restored bikes for sale. We are fortunate to live and work in a beautiful community characterized by it’s mountains, ocean, and commitment to treading lightly on our earth. We want to say “thank you” to you, our customers, for making Intervals possible and giving a little back in the process.